Sometimes, in order to help me love those I have the most trouble loving (e.g., Obama supporters), I have to remember who I used to be myself. One day in my life that seems to best capture who I was 30 years ago is Sunday, September 23, 1979. I was an engineering student at The Cooper Union, beginning my senior year, and I resided on Manhattan's lower east side. That day is interesting to me because it brought together so many things that seem to have typified various aspects of my life up to that point, and in some cases, since. To understand my day that Sunday, you need to know that I was a recreational consumer of LSD in those days, and that was a day I was tripping. (Strike 1 against me, from my current persective of a middle-class, middle-aged, well-respected-man-about-town-doing-the-best-things-so-conservatively perspective.) My acid friends and I had something very special planned: We attended the No Nukes Rally and Concert in Battery Park, under the shadow of the World Trade Center's twin towers. (That would be Strike 2, although I was never really anti-nuclear power - my stated reason for being there was to take footage for a film - which, however, I never completed.) Being against nuclear power is like being against the sun. I mean, I was tripping pretty heavily, but even I could see through that ... I wished I had worn a red shirt and brought a garbage bag with me. Anyhow, that was about the time I left, with one or two friends, I think. For some reason, we thought it would be cool to take the elevator up to the top of the World Trade Center. Which we did. 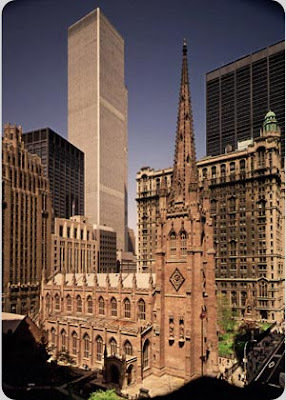 I felt very guilty about it, even at the time, because our boots were incredibly muddy (Battery Park being what it was at that time), and we tracked mud all over the inside of the WTC lobby. I heard the voice of my mom, ringing in my head, shaming me for tracking mud into someone else's place. Strike 3. After we rode the elevator back down, we went back outside and began to walk up Broadway. 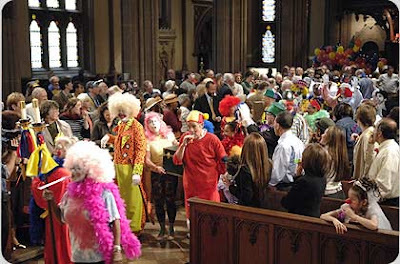 When we got to Wall Street, we rested on the grounds of Trinity Episcopal Church, Wall Street. And this is where I need to talk for a moment about Organized Religion. It is still fashionable for the young people I meet (e.g., in internet forums) to say that they are very spiritual, but that they detest Organized Religion. Other than that it is bunk, I have two things to say about that. The first is that once you get inside, you realize that Organized Religion is not organized at all. It is a howling mess of disorganization, if I ever saw one. And yet, as I sat on the porch of Trinity, Wall Street, I felt the same thing. That the very stones of this Episcopal church were crying out to me, and that they were crying out in the name of all Christian churches, and that they were crying out to me that Christianity was true. Those stones cried the same unutterable testimonies as I had heard from the Presbyterian church I had attended with my parents. It took getting inside, really inside, both kinds of churches to find out that they pretty much loathe each other. And the second thing is a corollary from that, which is: Because to the pagans outside, we all (in the several branches of Christ's church) appear as a monolithic One, it would be a Very Good Thing if we could all cry out the same Creeds. It would be good if we could all go back to orthodoxy, as Chesterton defined it: When the word "orthodoxy" is used here it means the Apostles' Creed, as understood by everybody calling himself Christian until a very short time ago and the general historic conduct of those who held such a creed. Of course, Chesterton wrote that in 1908, so that now we'd have to say "until a little over 100 years ago." My point is that we in the churches never know what pagan is sitting on our porch, listening to our testimony. We do not all proclaim the same Creed nowadays. Our actions prove it. 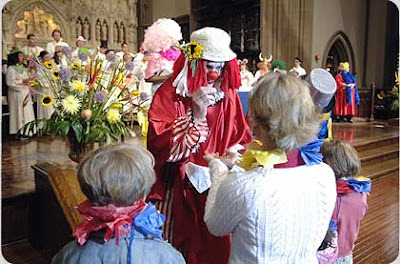 That same Trinity Episcopal Church, Wall Street, is now famous for the Clown Eucharist, which even in my acid-drenched mental state of September 23, 1979 I would have realized to be inauthentic to the "historic conduct of those who held such a creed." It belonged to that spirit of meaningless hilarity which I'd just left behind in Battery Park ... and I would not have listened to such nonsense.